As we become more of a global society, it is imperative for the work environment to mirror this diversity and for individuals to be supported in their professional development. Therefore, the aim of this chapter is to describe how the field of counseling can contribute to the advancement of workforce diversity education. The understanding and application of counseling skills (e.g., attending skills) can positively influence interactions within the workplace and enhance workforce diversity initiatives. A case study is included with discussion questions along with an exploration of future directions for enhancing workforce diversity. This chapter explores how counseling curricula can contribute to workforce diversity curricula and practices. 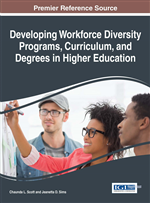 An overview of workforce diversity and workforce diversity education is included. Next, a summary of the antecedents of the counseling profession, history of multicultural counseling, and core multicultural competencies that gird the profession are explored. Following is a discussion of three specific courses within counseling curricula (Diversity and Social Justice in Counseling, Counseling Skills, and Group Counseling). Content from these courses can be integrated into workforce diversity courses to enhance interpersonal communication in the workplace. Additionally, opportunities for reflection and discussion of the counseling skills in workplace settings are provided. Specifically, critical discussion questions and a case study are included. The goal of the critical discussion questions is to enhance critical thinking skills and initiate discussions between classmates and the instructor. These questions can be used as journal starters to reflect in an ongoing journal or questions for small group discussions in class. The case study provides a real-life work scenario focused on multicultural concerns. The purpose of this case vignette is to analyze the various dynamics between the employee (Ana), her supervisor (Beverly), and co-worker (Mark). Furthermore, the case study encourages classroom discussion regarding the application of counseling principles in workforce diversity situations. Describe the historical roots of counseling and how it relates to the field of workforce diversity. Explain how counseling curricula can be an applicable to workforce diversity curricula. Analyze a work-related case study and brainstorm appropriate counseling skills to use in the case scenario from a culturally competent perspective.